Shoes in general protect people’s feet from getting hurt by sharp objects from the ground. They also allow one to walk longer distances and feel less exhausted afterwards. 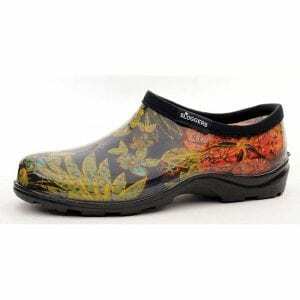 Over time, many different types of shoes have been made to serve specific purposes, such as fashion or use, and the waterproof shoes are one of those examples. As the name indicates, they are waterproof; even if it rains hard, one would not have to worry about their socks getting wet. While there are many variations, most waterproof shoes are sturdy and causal, allowing one to walk over the puddles and wet streets. Since the inner part of the shoes is free of water, it would not be necessary to crumple newspapers and put them inside the shoes. Bad smell is another problem when shoes are not properly dried, and one can avoid that as well with waterproof shoes. Many of them can be worn on a regular day, so they can be useful in outdoor activities including climbing mountains and walking on the beach. There are times when formal shoes are required throughout the day. Or, one may feel like wearing his or her favorite shoes that are both comfortable and elegant. On a rainy day, one is forced to either take the risk of damaging the expensive shoes or prepare an extra pair and change as needed. There might be a few options that are both waterproof and fancy, but it would be difficult to satisfy everyone’s preference in designs, textures, and materials. I think if one forms a thin layer of elastic and transparent material around the shoes, such as silicone, it may help maintaining both protection from the rain and fashionable design. The flexible material would be able to surround any type of shoes without damaging the overall shape. Also, the layer would be colorless, or close to transparent, so it would not interfere much with the original design. When the shoe inserts are placed inside of shoes, this waterproof layer is attached outside, and the area covered by the layer depends on the owner’s preference. There will be a variety of different options in thickness of the layer – one may choose to get a very thin and stretchy one wrapping around the shoes, or thicker, sturdier one that can be attached at one side. The modern toilet paper allows one to remove any remaining excrement after a visit to the restroom, which is a crucial process for people to stay clean. 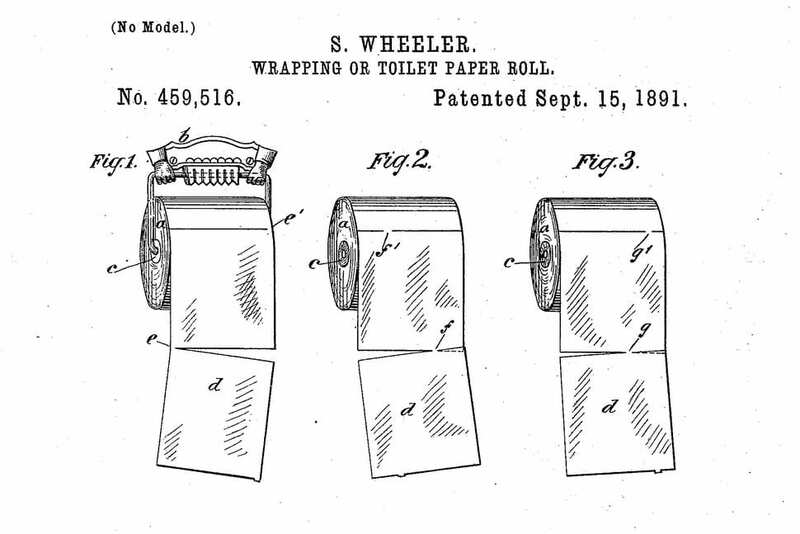 The toilet paper is an extremely long line of square sheets around a cardboard tube. This design allows packing a large amount of papers while taking small amount of space. The role of the cardboard tube is not just to wrap the papers, but also to place it in a holder. The holder is a horizontal bar that is attached on the wall close to the toilet; it usually has a cover that is pressed to make one pull and cut off the toilet paper easier. One may choose not to be bothered by the cover and grab the sheets by hands to use. Currently, there are many options for the thickness of each toilet paper, and each person has a different preference in the number of sheets per use. 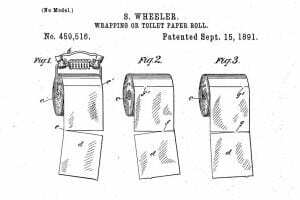 The fact that the modern toilet paper roll has not changed much since it was first introduced in the late 19th century shows its usefulness. I think there is a way to improve this product, mostly in terms of hygiene. Lots of germs are transferred during the moments when one touches the toilet paper. In a public restroom, the number of people using the toilet paper is much larger, which indicates that it is likely to contain things that are not wanted in the human body. Also, since the contamination in the area near the toilet paper is not as noticeable as that on the toilet seat, people tend to forget how dirty it could be. In my opinion, the best way to solve this issue is to avoid the direct physical contact with the unclean part of the toilet papers. While one may try to be careful as he or she deals with it, no one can tell if the paper is free of germs just by looking. That where the automatic toilet paper dispenser could be handy. Instead of grabbing and pulling off the toilet papers, one can place the hand near the sensor to make the paper come out. The number of sheets at a time would be an interesting thing to discuss about, but if people end up customizing every time they use the toilet by touching the device, it would defeat the whole purpose. I think if someone needs more, one can just wave at the dispenser again for more papers. 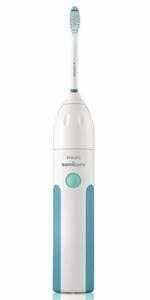 The electric toothbrush provides a way to clean one’s teeth more efficiently. Unlike the traditional toothbrush, the electric toothbrush has a battery and an electronic circuit that creates a vibration on the brush head. During the contact with the surface of one’s teeth, this rapid vibration allows up-and-down movement without manually having to move the toothbrush. The region between the teeth crown and the gum is where food particles get stuck easily, and not cleaning this part well could cause gum damages that weaken the teeth. While it is not too difficult to brush this area in the front teeth, it gets more and more challenging to do the same for the other teeth; since they are placed deep inside of the mouth, there is less room available for one to move his or her brush, and delicate control becomes almost impossible. Especially for the children and young adults who have not mastered the proper brushing skill, cavities in molar teeth are very common and painful to deal with. However, with electric toothbrush, one just needs to place the brush softly on the teeth and let it do the work to maintain the oral health. Replaceable brush head is another strength of the electric toothbrush, but this resulted in the separation between the body and the neck of the toothbrush. Although it is not necessarily a bad thing, it seems to cause some water to enter the body through the gap between the connecting parts. The first thing one may think of could be the safety issue involving the electricity and water, but most of the recent electric toothbrushes are considered safe from such danger. The less obvious problem is that water leaves stain and forms rust. The thin neck part containing the brush head is made to get wet by entering one’s mouth, and it easily dries with natural air. However, when water or saliva flows down and gets into the tiny space at the attachment point, it is very difficult to remove it even with tissue papers. Wet environment can cause chemical reaction or mold growth, which are not ideal in cleaning teeth. To solve the issue, I propose minimizing the replacing part – instead of changing the whole neck piece, only detaching the very top part with brush alone. By doing this, the remaining part could just be in one smooth piece that is fully waterproof. The connecting part between the head and the neck would have very small space, which would be easier to dry after use. Cooking involves knives and fire, which could be very dangerous. Even for experienced people, one careless mistake could result in much pain and long-lasting injuries. Especially for young adults who just started cooking on their own, each meal could be a challenge and a threat. 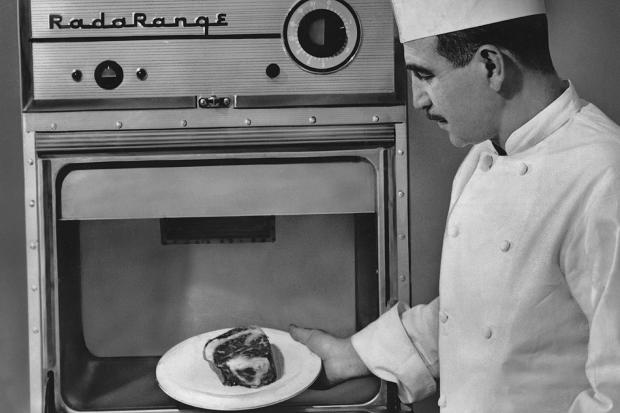 However, with the invention of microwaves, heating up the food has become much easier and safer. Instead of turning on the gas and lighting up the actual fire, one can just place the container filled with food inside a microwave and wait a few minutes. The microwave is time-efficient, as one does not have to assort everything in advance and put them in a pot in a specific order. Also, frozen food can be defrosted much faster, and the microwavable products are relatively cheap and convenient. Of course, it may not taste as great as some of the homemade food, microwave still provides an alternative option to eat for those who are inexperienced or short on time and resources. Even though using the microwave is relatively safer than dealing with actual fire, it can be quite dangerous if one puts things that should not enter the microwave. Unfortunately, there are too many things that should not be placed in the microwave, and it could be challenging to keep track of the entire list. For example, the presence of metal, which gets very hot really fast, could cause fire. However, sometimes it is not too obvious to tell, and one could easily overlook a small twist tie before trying to defrost some sliced bread. Plastics and Styrofoams not only melt but also release harmful chemicals. Furthermore, certain food that contains lots of water could explode in the microwave. In my opinion, it would be nice if a microwave has a detector that scans the item when it is initially placed. 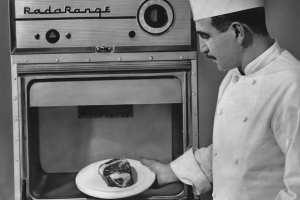 After going through the in-built library, if the food or container are considered as inappropriate or potentially dangerous, the microwave could alert the user. Since it would explain the reason why it should be removed, it would prevent disasters from carelessness and learn without having to buy a new microwave. If possible, maybe the detector could also recommend the ideal range of time in heating each type of food. In a situation where higher than usual temperature is observed, it could automatically shut down to prevent further heating. Compared to the traditional paper dictionary, the electronic dictionary provides much faster and easier way to search up unknown words. Before then, when one was trying to study a new language or stuck with a difficult word from a text, one had to open up a thick pile of dictionary and search for a tiny word. Even for the experienced users, it required some time to find the right word, and if one needed different kind of dictionary to compare with other languages, it required him or her to get another huge dictionary to repeat the same process. 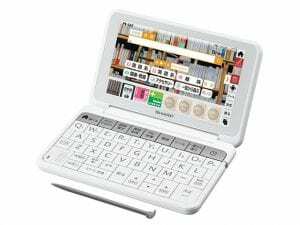 However, with electronic dictionary, one can easily look up the word by simply typing in, and one pocket-sized device can have many different languages. One does not have to purchase a whole new dictionary for the most recent edition, either. In these days, internet seems to serve the role for searching new words, but electronic dictionary is still a very useful method, especially in cases where constant and stable wifi is not available. Despite the fact that electronic dictionary, or even the internet, noticeably shortened the amount of time needed to look up a word, it still requires a process of typing and entering manually. Such action requires a full attention for a short period of time, and if one is in the middle of doing something different that also calls for high level of attention – such as reading or studying – it can be disruptive or annoying. Sometimes, one may type in the word inaccurately, which could fail to show the right result and waste time. Therefore, in order to improve this product, I came up with the idea of a wearable device that can aid people. It would look similar to the glasses, and as one reads through the text, it can immediately search a word when demanded. To find a word, it would not require one to enter it letter by letter; instead, just by focusing on one word for certain amount of time would be enough to show the results. An alternative option is to make the glasses to sense the actual tough of the text showing. In other words, one could just tap once on the page to tell the glasses which word one wants to know. It would require the latest technology to make it happen, but it would significantly decrease the time needed to look up new words.